Nita Leland's blog is about her creative and family life, including book reviews, art links and essays on color, creativity, watercolor, writing, teaching and other subjects. I've just finished reading Rheni Tauchid's The New Acrylics: Complete Guide to the New Generation of Acrylic Paints. (Watson-Guptill, 2005). I like this book very much, even though it doesn't have some of the acrylic mediums that have become available since the book was published in 2005. It's really hard to keep up with these new products, since it takes about two years for a book to be written and produced for publication. Nevertheless, the book is an excellent reference for painters in acrylics. I like the technical information on paints (not all artists care about this as I do, though) and I especially like the illustrations of techniques, the samplers and demos that show how different techniques look during the process of application. There is some very fine artwork interspersed on the pages, but the emphasis is clearly on techniques and materials. I'm going to add this book to my collection, as I find it to be both informative and inspirational, just because of the exciting possibilities shown through the demo photos. Nancy Reyner's book was released by North Light early in 2008. Acrylic Revolution: New tricks and techniques for working with the world's most versatile medium provides information on setting up tools and materials for working with acrylics, along with a comprehensive glossary. This is a "techniques book," with detailed information and illustrations using different acrylic viscosity and textures. A few paintings by various artists are included in a gallery, showing different approaches to painting with acrylics. Reyner explains the behavior of the mediums, how to deal with quick drying paints and mediums, and how to finish the artwork with varnish, a step many artists skip over. I especially like Guy Kelly's design, which unifies the pages of complex demos and hands-on photos. Patti Brady's book, Rethinking Acrylics: Radical solutions for exploiting the world's most versatile medium. (North Light, 2009) is worth the price just for the chart on page 23, showing the effects of 15 different mediums, with a short description telling in a nutshell what each does. I also like the information on how acrylic paints are made, although I know a lot of artists aren't interested in this. Brady provides information and techniques not included in the Reyner book, as well as demonstrations by 28 acrylic artists. Want to print acrylic paint film (skins) in your ink jet printer? Need to know more about interference and metallic acrylic paints? Want to try encaustic with acrylic? It's all here, and more. Reyner and Brady are active in the Working Artist Program of Golden Artist Colors, Inc., and Tauchid works with Tri-Art in Canada, but these books may be used by artists who work with other brands of acrylics. I've been painting and teaching watercolor since the 70s. My bestselling books on color, collage and creativity are published by North Light Books. Please visit my website www.nitaleland.com . July 21, 12, 13 from 9-4. Nita Leland's Color Clinic. Evendale Cultural Arts Center, 10500 Reading Road, Cincinnati, Ohio. Contact Susan Gordy. To book a 3-day workshop, please email me to reserve a date. 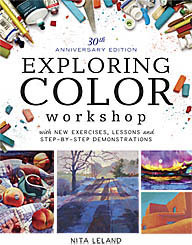 Workshops are available in color or watercolor.